This was a calamity for the Corps of Discovery. 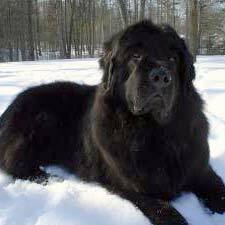 Seaman, a “dogg of the Newfoundland breed,” had been with Lewis since he set out from Pittsburgh in the summer of 1803. Lewis had paid $20 for the dog, a small fortune in those days. While it is generally assumed that Seaman was black, his color is recorded nowhere in the journals. 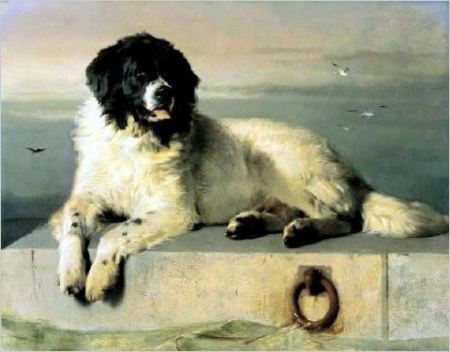 He may have been brown, gray, or black and white (a variety now known as the Landseer). As an addition to the permanent party, Seaman quickly proved his worth and hardihood. He was a frequent companion during Lewis’s long walks on shore, guarded the camp, assisted the men with their hunting, and impressed the Native Americans with his size and “sagacity.” A strong swimmer due to his big webbed feet, Seaman was often sent to retrieve game the men shot in or along the river. One particular beaver, not quite dead, almost proved Seaman’s undoing. A beaver bite to the hind leg artery no doubt inflicted an alarming, spurting wound. Seaman’s distress would have been painfully obvious. For Lewis, suddenly pressed into service as a veterinarian, the first task was to stop the bleeding. He would first have applied pressure to the spurting artery with his fingers, trying to stanch the flow of blood, and perhaps applied a cloth compress, being careful not to reopen the wound when it finally began to clot. Depending on where Seaman’s wound was, it’s possible that Lewis used the fancy $3.50 axle tourniquet he bought at Gillaspy and Strong’s druggist in Philadelphia. Fortunately, Lewis was able to get the bleeding under control before the dog went into shock. The journals do no record how he managed to keep Seaman from biting or worrying the wound during the next few days of recovery. They didn’t have plastic head cones in those days, so the dog was on his own. The dog’s strength, good health, and the ministrations of his human friends pulled him through. The next time Lewis mentions Seaman in his journal, about ten days later, the dog is back on guard duty. Last night we were all allarmed by a large buffaloe Bull, which swam over from the opposite shore and coming along side of the white perogue, climbed over it to land, he then alarmed ran up the bank in full speed directly towards the fires, and was within 18 inches of the heads of some of the men who lay sleeping before the centinel could allarm him or make him change his course, still more alarmed, he now took his direction immediately towards our lodge, passing between 4 fires and within a few inches of the heads of one range of the men as they yet lay sleeping, when he came near the tent, my dog saved us by causing him to change his course a second time, which he did by turning a little to the right, and was quickly out of sight, leaving us by this time all in an uproar with our guns in or hands, enquiring of each other the case of the alarm, which after a few moments was explained by the centinel; we were happy to find no one hirt. It is not known for certain whether Seaman made it back to St. Louis, though it seems probable that at least one of the Expedition’s journal keepers would have recorded it if something had happened to the dog. More likely, Seaman completed one of the greatest adventures a dog ever experienced. In the years following the Expedition, Seaman has become one of the most celebrated dogs in American history, second only, perhaps, to Franklin D. Roosevelt’s Fala. 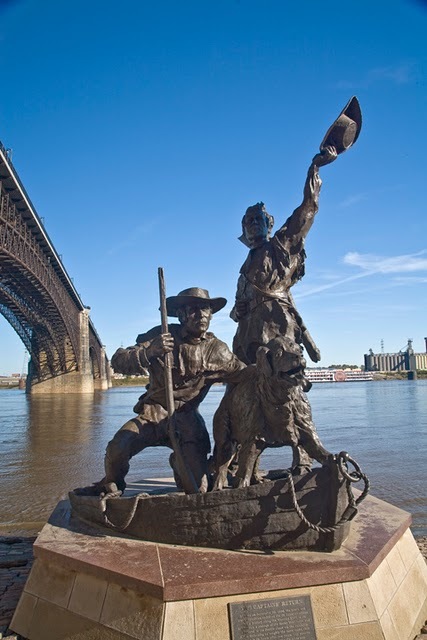 In statuary along the Lewis & Clark trail, he is frequently included alongside Lewis, Clark, Sacagawea, and York.